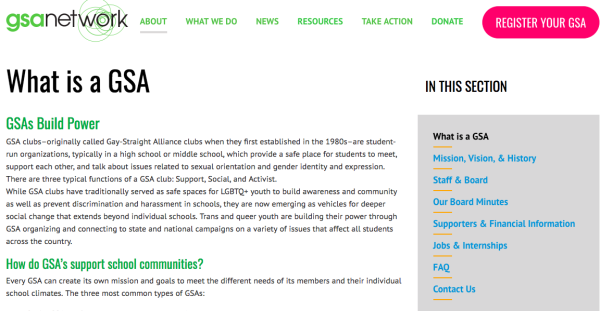 GSA clubs–originally called Gay-Straight Alliance clubs when they first established in the 1980s–are student-run organizations, typically in a high school or middle school, which provide a safe place for students to meet, support each other, and talk about issues related to sexual orientation and gender identity and expression. There are three typical functions of a GSA club: Support, Social, and Activist. 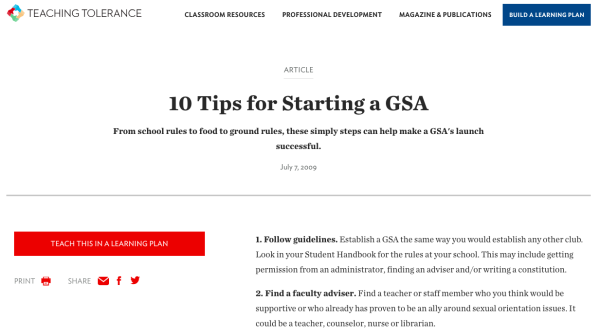 Teaching Tolerance's Tips for starting a GSA at your school. ​GSAs help make schools safer for all students by providing support, educating others in their school about LGBT issues, and engaging in awareness activities like the national Day of Silence. GSAs also allow LGBT and straight students to work together to take on issues that affect all students, including harassment and discrimination based on sexual orientation, gender identity, and gender expression. 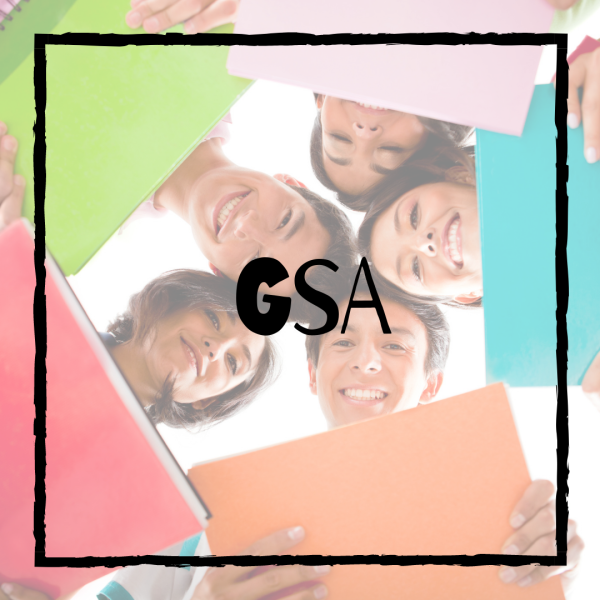 This GSA handbook created through San Diego Unified School District's LGBTQIA+ Education and Advocacy Office houses information on student rights, name changes, GSA leadership and agreements, and much more! 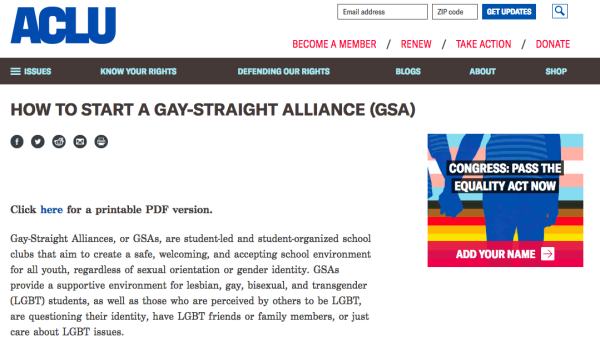 Check out this great resource for GSA Recruitment on your school campus. It includes activities and models of lunchtime recruitment options and ideas. This is an original creation of San Diego Unified teacher Shane Parmely. See a GSA in Action!! This exhaustive list of LGBTQIA+ specific videos provides video titles, url, a brief synopsis, run time, appropriate audience, overarching themes, and discussion suggestions. Find videos to watch and discuss in your GSA or even with your friends. Sometimes it's helpful to see other students in action. Check out this video of a student running their GSA for the first time! 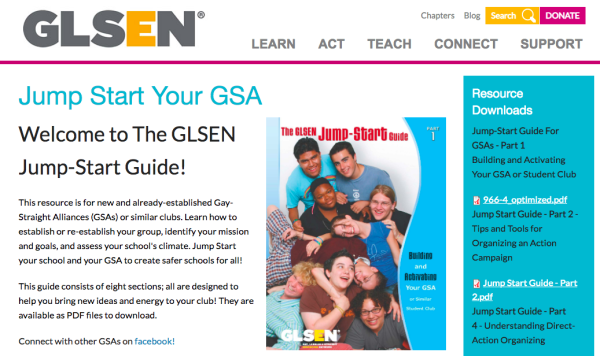 There are so many places you can find ideas and information for starting and running your very own GSA meetings.